I'm packing my bag for a few days in Denver and wondering what the Brewers Association will have to say about the challenges facing craft beer. The industry is still growing, but growth is slowing and there are some dank undercurrents swirling around in the background. One challenge is the blurring of what craft beer is, a reality in the wake of buyouts that have happened over the last few of years. It used to be easy for consumers to identify and differentiate craft beer and fake craft beer. Things have gotten more complicated as craft beer has gone mainstream. We now have a large pool of craft consumers, many of them not particularly experienced or knowledgeable, looking at shelves and tap handles with almost unlimited choices. It's easy to get lost. Obviously, the Brewers Association has rules about what constitutes independent craft beer. But those rules are relatively unknown outside the geek crowd and, anyway, a lot of consumers couldn't care less about who owns the brewery that makes the beer they drink. 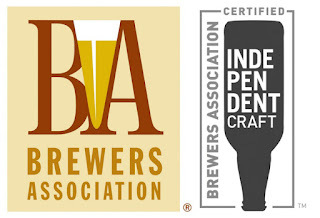 The Brewers Association's recent response to this quandary is the Independent Craft seal shown above. Qualified breweries can acquire the seal and put it on packaging, post it around their pub or brewery and use it in other ways. Some 2,000 independent craft breweries are evidently using the seal, according to this report. Naturally, there are differences of opinion regarding the value of the seal. Some don't like the design. They wanted something fancier. Terrific. For its part, big beer complains that consumers don't care who makes their beer as long as it's quality. Dandy. And not really a surprise. I'll be interested to hear what more the BA has to say about the seal and their continuing effort to promote independent craft beer by making it easier for consumers who care to differentiate between independent and non-independent craft. Enough said. A far more serious issue is the slowdown that's currently in motion. I'm reading reports of significant cutbacks and restructuring of sales organizations at regional and larger craft breweries. These reports are appearing in some of the pro newsletters and are pretty reliable. The slowdown at larger craft breweries is a symptom of the explosion in the number of breweries...more than 5,000 by the end of 2016. Craft beer, which derived fast growth largely via large regional breweries for many years, has gone local. Consumers can in many cases find the beer they want in or near their neighborhood. I'm not sure many of us predicted that trajectory. Not that long ago, we were watching big craft brands like Sam Adams, Sierra Nevada and others put up exponential growth numbers. There was no apparent end in sight. But things have shifted, driven by consumer tastes for local beer. This development has put a squeeze on large breweries and, as discussed here recently, extends to some established, smaller breweries. One of the reports I'm reading says New Hampshire-based Smuttynose, which sold 51,000 barrels in 2015 and invested $18 million in a new brewery to support additional growth, has laid off staff and encouraged others to pursue other opportunities. The theme at work is that large and small breweries are having a tough time selling their beer in distant markets, where we have to assume new, local breweries are soaking up share. Smuttynose is responding to that challenge by actively shrinking its distribution footprint. It isn't alone. This situation is creating anxiety in the industry. What's going to happen to breweries that assumed debt to finance the brewery expansions that are now underutilized due to declining sales volumes? That's certainly the case with Smuttynose. What happens to that capacity? What about the debt, in cases where that's an issue? I'm not sure the Brewers Association will have much to say about the emerging reality. It has actively encouraged the culture of new breweries, despite the fact that large regional breweries have been the primary growth drivers. Now things have shifted and some in the industry have painted themselves into corners. Not ideal.